Recovery of a VMDK file after it has been deleted or gone missing from A VMWare system is a difficult operation. The VMFS/ESXi is a basic operating system that does not have undelete features built in, hopefully VMWare will build this into later versions of their file systems. At MjM we are able to recover deleted VMWare VMDK files. We will need access to the disk array or LUN where the deleted or missing file was. We offer a range of service levels to suit all businesses and will do our utmost to recover the entire VM into a working state, or provide access to the original data it contained. We can recover from all server and san systems including HP, DELL EMC2, IBM, Fujitsu, etc. When Roseweed drives with failed heads first started appearing for data recovery, we found out very quickly that safe removal and replacement of the heads was going to be a very difficult procedure. Because there is no room to use a standard head comb, and no tools were commercially available, we spoke with Specialist Engineer Nikola Radovanovic at HDD Surgery in Serbia. His company has been making state-of-the-art head combs for years and we asked him if there were any plans on making a comb for these drives. He told us that he was already on the case and a few weeks later we took delivery of the Seagate Slimline Head Combs. Because of the limited space to work in, the methodology behind these head combs is considerably different to other types of combs. With these drives, the ramp has to be removed in order to take out the heads. To achieve this, the comb is attached to the head gimbal assemble and the comb then slides through the head springs, lifting them enough so that they can be moved over the platter without damaging either the heads or the platters. At this stage the ramp can be removed and the heads can be positioned back into the park position and removed normally. Replacement heads are then put in and reassembled by reversing the above procedure. As is usual with HDD Surgery Tools we have found this addition a great help in making head stack replacements on Seagate Slimline drives. What was once a very difficult and intricate task has now been greatly simplified. Below is a short promotional video made by HDD surgery showing a part of the process. Please note that the above video is for promotional purposes only and to show the functionality of the tool. It is not meant as an instructional video and does not use standard clean room procedures. MjM Data Recovery ltd are proud to have been approved to the Trading Standards 'Buy with Confidence' scheme. After an in depth audit, confirming details with customers and interviews we were accepted to be a company that people can trust. 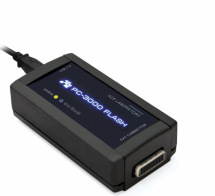 The PC3000 Flash is one of the most useful tools for recovering data directly from FLASH memory chips. With advanced features and an automatic mode it can make a difficult process very simple. There is a massive database for existing devices including NAND chips with standard and all types of processors, if you have a tech support contract an Ace Lab engineer will log in to your computer to help with the more difficult cases. It comes with 48 pin TSOP, TLGA 52, BGA 153 and the circuit board adapters as standard and there are other adapters available for other chips including the latest 'Spider' tool for working on Monolithic memory devices. Acelab have been supplying advanced data recovery equipment for at least 20 years and offer a range of beginner to advanced recovery courses and how to use their equipment to get the best from it. A massive database of devices and nand types is built in, and another online database developed by Acelab and users that want to share information is available to those with the support contract. 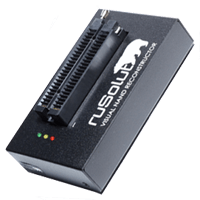 The Rusolut is the latest tool to come to the market and is aimed at serious data recovery companies. It uses a concept based around the VNR software that comes with the tool. It is a modular system where the various stages to read and rebuild the data content is built up as a visual object. The software has a lot of other advanced features like viewing the content as a bitmap image, this helps to identify XOR patterns and can show anomalies in blocks such as identifying bad blocks and noise within the image which can be used to modify read voltages and other parameters to get a clean read of the device under test. A very advanced tool, Rusolut know this and offer training packages on using the tool and software. It has a growing userbase and a large database of existing NAND devices and processor types so can be used straight out of the box. There is also a growing online database of new devices where parameters can be downloaded for use. The Soft Center flash reader and flash extractor have been around since the early 2000's we started using this when the software was DOS based but has now developed into a full blown product that is capable of recovering a lot of NAND based memory devices. It uses a visual representation of reconstructing data. The software is very advanced and has a steep learning curve. There is an online manual to help you get started. There are regular database updates for the tool but Soft Center do not run training courses on using it, so it is a real hands on approach to get the best from it. Whilst a volume set is nothing exceptional to write about, in this instance the job had been to another data recovery company and they pronounced it as unrecoverable. The customer had thought that the failed drive contained a single data partition. However, soon after analysing the file system meta-data, we discovered that the drive was the second drive from a two drive volume set. We phoned the customer, and they confirmed there was in fact another disk installed in the server, but they thought that only had the boot partition and the data was stored on the failed drive sent for recovery. Once we had repaired the failed disk and analysed the layouts we were able to completely rebuild the data structures that resulted with another happy customer. What is concerning is that the first company it had been to has written the job off as unrecoverable, when a simple check that is carried out as standard practice by MjM could have confirmed what they were looking at. This is where MjM Data Recovery's experience in working with RAID and Volume sets shows how important an understanding of file system components are. How many other companies have been told the same thing by inexperienced companies and written off the job? If the customer had taken the previous data recovery company's advice, then they would have been a situation without their data and taking on the cost to manually re-enter the missing data.